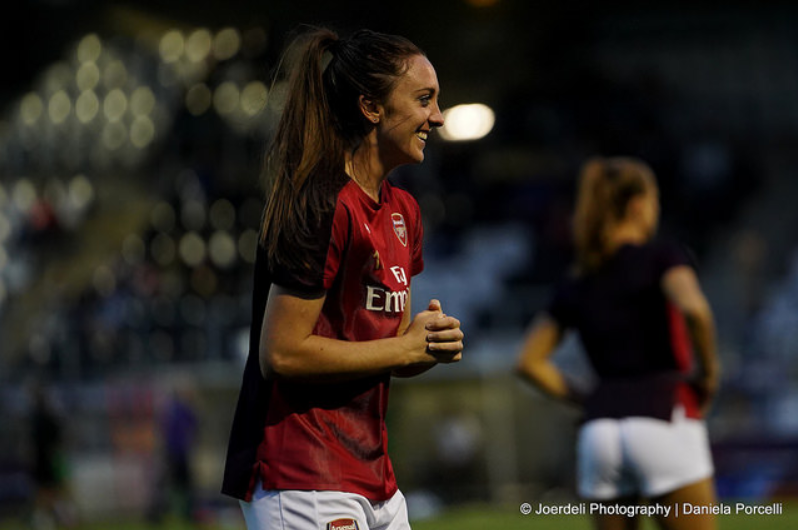 Speaking exclusively to VAVEL UK, Arsenal and Scotland's Lisa Evans talked about UEFA's #WePlayStrong initiative as well as giving her feelings about the 2018/19 season and upcoming World Cup. Growing up, Lisa Evans had her doubts, just like any child. Hers were sports orientated, though, with the ambition of playing football clouded by impeding variables. She was in a sporting environment where she had just one female role model and was under the assumption that if she wanted to play football then it would have to be alongside her opposite gender. Yet, the 26-year-old is now playing in the WSL for Arsenal, a fully professional women’s league, something that would have been a distant fantasy to not only her when she was younger, but to many now playing in the division. “I grew up presuming I’d play men’s football in a men’s league, that’s all I had,” she revealed. It’s quite something, therefore, that Evans is now one of many female influencers at the forefront of UEFA’s #WePlayStrong initiative, a campaign set out to make girls proud to play football, rather than suffering from the stigmas that come from playing the game. UEFA’s dedicated campaign is aimed at inspiring the next generation of female footballers and has been hugely successful, bolstering nearly 9,000 Twitter followers and over 8,000 YouTube subscribers with some videos receiving as many as half a million views. 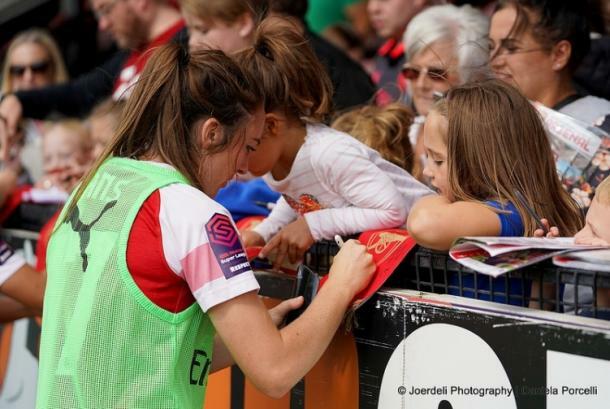 Women's football has come an awfully long way in recent years, participation figures for young girls have increased whilst attendances and viewership have also gained in numbers. But these developments are only recent, with campaigns such as #WePlayStrong leading the way in encouraging more younger girls to get involved or stay in football. "It's a really positive thing and if I was younger I'd absolutely look up to that and want to be shown these things. It's a really good initiative and one I have a lot of time for and want to invest in," Evans said. UEFA's initiative is ensuring primarily that girls feel proud to play football, creating a better pathway into the game whilst using women's footballers to inspire the upcoming generation. It's something that unfortunately Evans was not fortunate enough to receive when she was younger. "It's massive to have role models," she started. "I think when I was growing up there wasn't as many female role models - especially not in football and playing professional. "When I was younger I looked up to Julie Fleeting. She was really the only one that went down to Arsenal at the time and managed to play professional football. It's massively important to be a role model for these younger kids coming through," Evans added. Changing the perception of women's football has been major over the last decade in particular, with accessibility, particularly through social media becoming a key tool in not only UEFA's bid to improve the number of girls interested, but is something the FA have used through schemes such as Wild Cats. With the #WePlayStrong campaign, the former Bayern Munich player was filming vlogs for YouTube called Press Play which involved other women's stars and gave a fascinating insight into the life of a footballer. "It's been amazing with the social media side of it. Giving them [the audience] a twist on what it's like being a professional footballer. "You've got the training and the hard work we put in but just the other side of that and what we do in our day to day lives. It's good to show people an insight into what other stuff we actually get up to and how privileged we are and what a privileged position we're in." Speaking about showing a different side to a footballer's life, Evans offered an eye into what her life involves away from football. "Living in London there's everything you can do in the whole world. It's a massive city. I like travelling and I like going to different cities and getting out. I'm just chilling, going for coffee, going to the cinema, eating out in restaurants. It's just everyday life," she described. Women's football at an international level has had a major impact on rising participation figures and attendances in women's football. With a World Cup in 2019, we could see yet another increase. Team GB's impact at London 2012 and the Lionesses success at the previous World Cup in 2015 have both had positive consequences on those factors in England. As a result, the versatile Arsenal player is hoping that a successful tournament this summer for Scotland will have the same effect back in her home nation. "To see how much women's football is growing right now in England, ultimately we're trying to tag along with that and to really push for Scottish women's football to develop," she explained. "Our first major tournament we had at the Euros, obviously we were a bit disappointed performance wise but it has had a little impact, even on fans going to games or just the media we have at Scottish women's football so hopefully we can really pick off now." Scotland's first game of the World Cup in France later this year sees them take on England in a match which will be billed up significantly as the tournament approaches. However, Evans is keeping her feet firmly on the ground in the build-up to the competition. "That was the fixture that everyone wanted, Scotland v England. For me personally, I'm not looking that far ahead. I just want to get myself in the squad - it's a really competitive squad that we have. I think we'll talk about team goals nearer the time and what we expect of ourselves," she noted. Photo: Joerdeli Photography | Daniela Porcelli. For now, Evans' focus is firmly on domestic success, with Arsenal in the running to lift the league title. 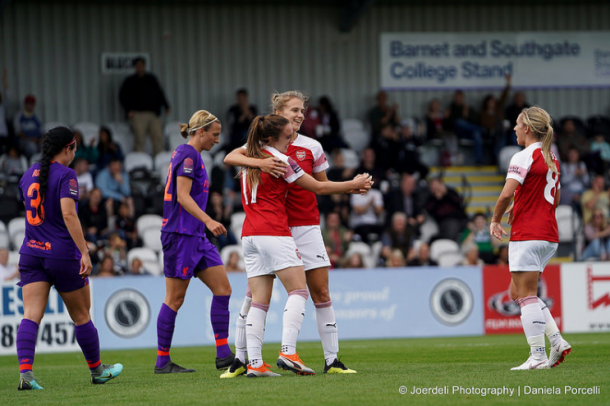 The Gunners are having a wonderful season under the stewardship of Joe Montemurro with the club sitting second in the WSL, three points off Manchester City but with two games in hand. Analysing the season, she stated: "We've started the season really well. We got put out of the FA Cup which was obviously really disappointing for us but on the whole, we've had a really good season. We've struggled with a lot of injuries and two of those times we've still had really good results. We're in a really good position now." Arsenal's main aim was to get back into the Champions League ahead of next season by finishing in the top two, which for a club such as their selves, is exactly where they should be according to the Scot: "A club like Arsenal, the stature of the club and the men's team included in that - it is a club that has dominated the way in terms of women's football over the past 10-15 years so it's about getting that level back. That starts with qualifying for the Champions League," she remarked. Evans has dealt with injury this term, something which isn't new to an Arsenal squad who have been plagued with sidelined players. Key individuals in Jordan Nobbs and Kim Little are enduring and have endured lengthy layoffs. However, under Montemurro, she feels as though the club has improved tremendously since he arrived at Meadow Park in late 2017. "Joe has made a massive difference and the players he brought in last summer have massively helped the team," she claimed. "He's a really good honest guy, he plays football in a really good style and I think he's just always open and willing to learn more about football. He's really hungry and ambitious as a coach which I just think helps the girls be really positive and energetic in training - he's just a really good guy to be around," the Scot observed. Since the Australian coach took over, the more attacking player in Evans has had to take a back seat with various injuries in the side meaning she has had to play in defence on occasion. But it's not something that's phased her: "One week I find myself on the left wing and then the other I find myself at right-back but it's something I've really enjoyed. It's made me an all-around better player." The obstacle of playing in an unfamiliar position pales in comparison to the struggles young girls have had trying to get into football, though. Timely, Evans spoke in what was a record-breaking week for the game. The Wanda Metropolitano witnessed a domestic European record crowd of 60,739 for a women's game as Barcelona beat Atletico Madrid 2-0 last weekend. It's something that doesn’t only offer a refreshing glimpse of how far we’ve come, but it also gives a wonderful indication of just how well women’s sport is now perceived.